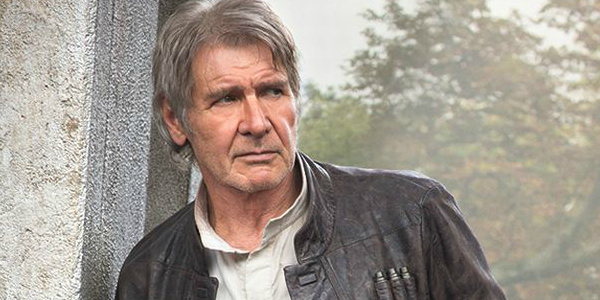 The following story contains spoilers for Star Wars: The Force Awakens. For real. There are people out there who might not know this. This is protection for them. After establishing himself as the rogue anti-hero of the Star Wars saga, Han Solo (Harrison Ford) finally sacrificed himself in a last-ditch effort to connect with his estranged son, Ben (Adam Driver), at the tail end of The Force Awakens. Some, who had listened to Ford talk about wanting to die a hero’s death, expected the moment. But it was still largely tragic, and led to some emotional fallout among the Star Wars community. Daisy Ridley, who witnessed the moment in person, has a great theory as to why Han’s death affected so many people so deeply. When you watch something you feel removed from, it becomes that incredible thing of it feeling very close and very far away. You probably have a bigger emotional reaction than reading a newspaper and just seeing facts and figures [because] instead you see someone’s life play out, their soul, and the way they react and respond to the world around them. … If everybody puts a piece of themselves into Han Solo and Han Solo dies – in the cinema, where it’s dark – you can express it, and it alleviates some of the pain. His death is obviously not as important as actual lives that are lost, but people probably use it as some kind of carrier for the grief. That’s very true. There have been instances in pop culture where fans of a given franchise will mourn the loss of a character, be it from a television series, or a film franchise like Harry Potter or the Lord of the Rings. Quite often, if we have lived with these characters for extended periods of time, it becomes harder to allow the author or director to make the creative choice to take this person away from us. But as Ridley said, these feelings of grief and despair might be tied to something much deeper that is happening in the individual’s personal life, and the events in Star Wars: The Force Awakens only assist in the coping of that sadness. The visual and auditory components [of a movie] can stimulate emotions in powerful ways, providing the opportunity to engage fully with story, to get emotions out of your system, to stir empathy for the characters (and possibly for oneself) and perhaps even feel less alone in your situation. When you are depressed and brain energy is at an ebb, the sensory input of the movie can stimulate your interest and require far less energy to take in the story than reading requires. How did the death of Han Solo affect you when you watched it in a theater? Have you revisited it now that the movie’s available on home video? Has the scene gotten any easier to process?